On World Animal Day, which aims to bring attention to the plight of animals worldwide, Claire Regnault, Senior Curator History, explores the work of Jane Dodd – a jeweller whose exquisitely rendered work draws on the cruel history of blood sports. Jane Dodd is a contemporary New Zealand jeweller, who throughout her career has drawn inspiration from a variety of subject matter, including history, cartography, diaries, and architecture. Animals, or rather bits of animals, however, have dominated her work over the last decade. 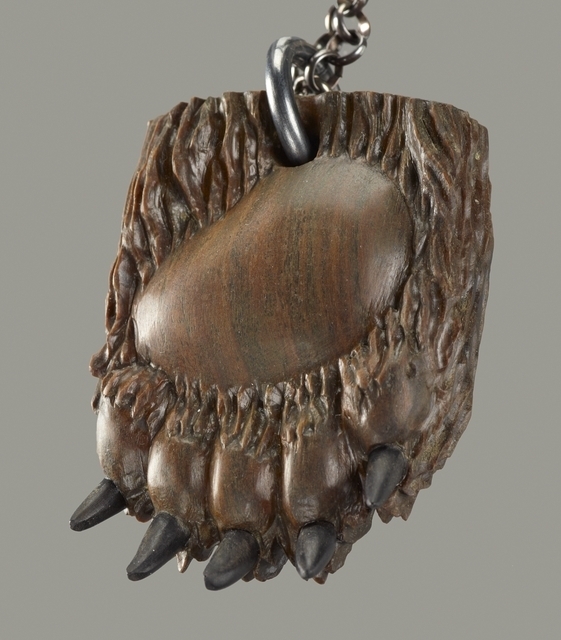 This bear paw, carved from lignum vitae, is from a body of work entitled Blood Sports, the first series of which was launched in late 2011. A ‘blood sport’ is defined as a contest that includes bloodshed, in particular a sport that involves animals being killed or hurt for human entertainment. Bears – brown and polar – are at the heart of this series. 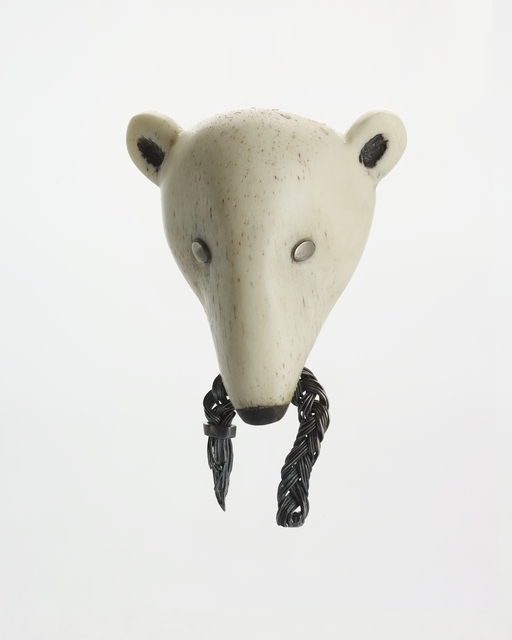 Dodd’s works reference the ancient history of talismanic and trophy body adornment, in which animal parts – in particular teeth, claws, horns, antlers, and beaks; that is, the dangerous parts – are transformed into human adornments, transferring the animal’s power to the wearer and revealing human superiority over the natural world. In England, bear-baiting was a very popular blood sport from the 13th century through to 1835, when it was finally banned. London’s Southbank was known for its baiting arenas or ‘Bear Gardens’ as they were euphemistically called. As the bears’ claws and canine teeth had been removed, it was hardly a fair fight. In comparison to the sorry animals, Dodd’s bears are armed with axes and claws of silver and gold, and fight back. Other wild animals join the bears in rebellion, and the collection of human trophies. A blue-eyed panther bites down on a severed human hand. A wolf claims a string of pearls. A polar bear devours an explorer’s map. Another a silver plait. Dodd was particularly captivated by the ‘Green Vault’ (Grünes Gewölbe) at Residenzschloss in Dresden. Founded in 1723 by the Saxon king Augustus II the Strong (1694–1733), it houses over 3,000 treasures renowned for their opulence and exquisite craftsmanship (you can take a panoramic tour online). 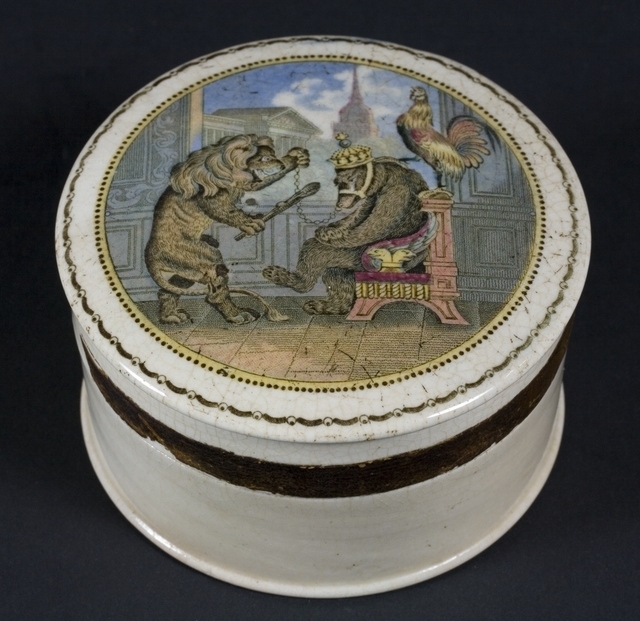 As well as being a connoisseur collector, Augustus II the Strong was also renowned for his prowess at a local sport known as Fuchsprellen, or ‘fox tossing’, which was played by noble men and women. The ‘game’ comprised of foxes, having been stockpiled by the gamekeeper, being released onto a field lined with tossing partners. As soon as a fox stepped onto the prelltuch, or ‘bouncing cloth’, participants pulled it taunt, hurtling the fox as high into the air as possible. Augustus II the Strong liked to show off his strength by using a single finger to pull his end of the tossing sling. To keep things interesting, other animals were also released onto the field to ensuing chaos. At one of Augustus II’s matches 687 foxes, 533 hares, 34 badgers, and 21 wildcats were killed by tossing and clubbing. The sport had grown out of earlier animal battles held in the city’s central market where bears, wolves, stags, and boars were pitted against each other. With claws and teeth aplenty, the human participants did not necessarily come away unscathed. 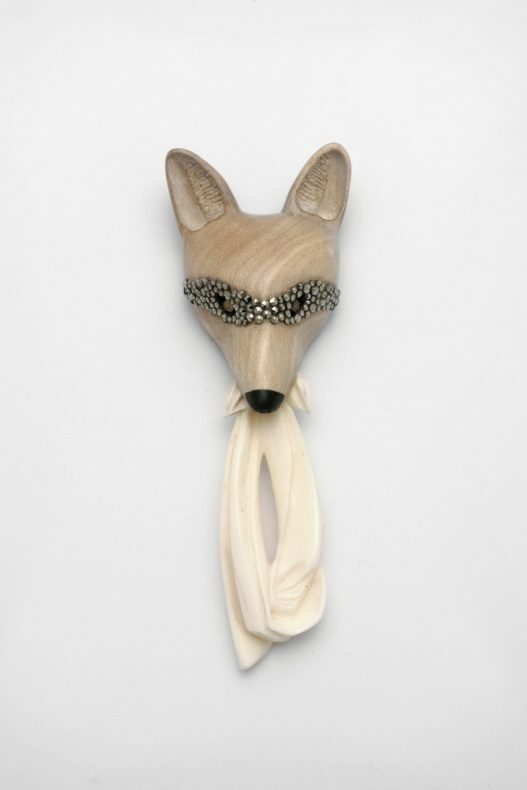 Dodd’s Fuchsprellen brooch references a masked version of this cruel sport, in which the participants, who were in fancy dress, dressed the foxes up as caricatures of unpopular figures. Dodd’s noble fox wears a mask of marcasite, and holds a sling in its jaws, ready to enact revenge. 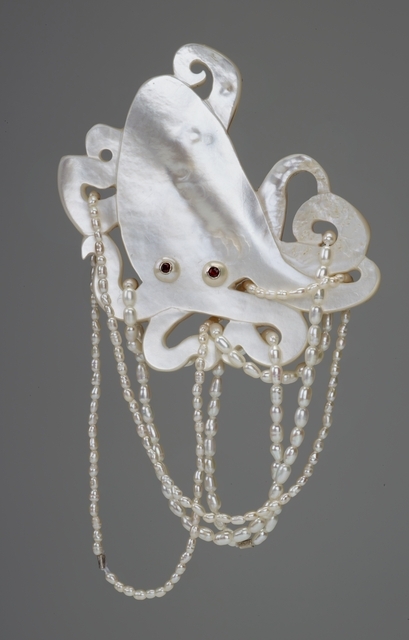 The brooch below, however, is inspired by a more recent sporting craze, albeit a brief one – octopus wrestling. The fad took off on the west coast of the US in the 1960s, with the annual World Octopus Wrestling Championships attracting over 5,000 spectators each year. It was banned in the 1970s. In New Zealand, ‘animal fighting ventures’ are covered by Animal Welfare Act 1999. It is illegal to knowingly own, possess, keep, train, or breed an animal for the purposes of having that animal participate in an animal fighting venture; or sell, buy, transport, or deliver to another person any animal for the purposes of having the animal participate in an animal fighting venture. World Animal Day was founded in 1925 by Heinrich Zimmerman. He chose 4 October to mark the day, as it is the feast day of Francis of Assisi (1181–1226), the patron saint of animals. In celebration of both events, the SPCA has joined forces with churches around New Zealand to present ‘The Blessing of the Animals’ – a day for humans to give thanks to their animal companions. Philip Stubbes, Anatomie of Abuses, 1583 quoted in Edward Brooke-Hitching, Fox Tossing and other forgotten and dangerous sports, pastimes and games, New York, 2015, p. 36. Quoted in Marina Warner, From the Beast to the Blonde, London, 1994, p. 302. Jane Dodd quoted in Bronwyn Lloyd, ‘Silt Castles and Buried Safety Pins’, Lugosi’s Children, Objectspace, Auckland, 2011, p. 12. Jane Dodd, Rococo Revolution, 2014. Unpaginated exhibition catalogue. We still have rodeos, some events of which can hardly be pleasurable for the animals involved. After I saw a calf have its neck broken during a calf roping event, my eyes were opened and I have never attended a rodeo since. Exactly. We may have banned animals fighting animals for entertainment in New Zealand but not humans against animals. Somehow we think this isn’t an ‘animal fighting venture’.